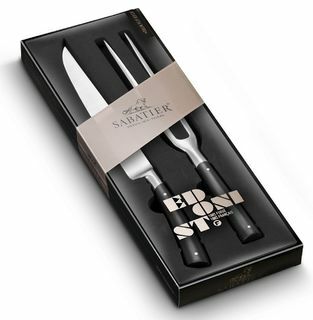 Sabatier Lion was founded by Phillipe Sabatier in the Thiers region of France in 1812. This range of superbly crafted knives carries their dedication to quality, elegance and tradition. The Edonist range is fully forged 4116 Nitro+ X50CrMoV15N stainless steel. With a Rockwell hardness of 58, this superior combination of carbon, chromium, molybdenum and vanadium, infused with nitrogen increases the knives strength, hardness and durability, allowing them to retain their edge yet remain soft enough to sharpen easily. 100% made in France, this range of knives is individually hand finished and carry a 25 year warranty.